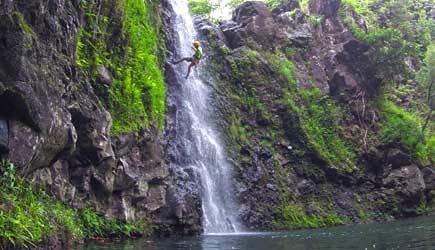 Waterfall rappelling is a new and exciting tour option for Maui vacationers! You learn to do something called "Canyoneering" as you rappel over cliffs with cascading waterfalls in a rainforest canyon. 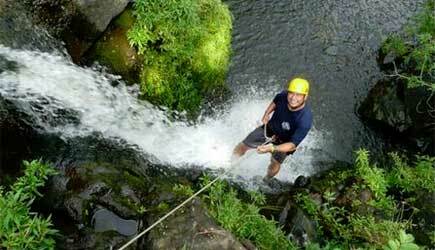 Rappel Maui will pick you up at a central meeting point and transport you to this privately-owned site about an hour along the famous "Road to Hana." You will gear up at a lush 26 acre botanical garden, and hike a short distance on private trails through the jungle. Your guides will give you a lesson on rappel basics, and brief you on safety procedures throughout the tour. Check In for the tours is 15 minutes prior to departure time at the Kihei Park & Ride. The tour includes plenty of bottled water, and a catered lunch is provided daily, using fresh ingredients. Men should wear swim trunks or light-weight pants, and a quick-drying shirt. Women should wear surf shorts, yoga pants or quick-drying pants, and a shirt, tankini or bikini top. Swimsuits are not a good idea. In the winter bring a wetsuit top, if you have one. 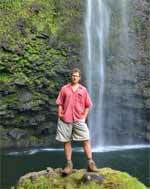 They provide special traction, felt-soled water shoes that you can hike, rappel and swim in. So, it doesn't matter what personal shoes you wear. Bring a towel, cameras, and/or waterproof camera. They provide the rest of the gear, including backpacks. Keep valuables to a minimum (cell phone, wallet, camera), and such small items will fit in their waterproof kegs. Whatever you wear will get wet, so bring another set of clothes to change into at the end of the trip. The equipment they provide are water shoes, canyoneering backpack, helmet, harness, locking carabiners, safety lanyard (cowstail), rappelling device. Check out the Rappel Tour options below! You will do three different "drops" during the event. The first rappel is a practice area with a 60 foot not-quite-90-degree vertical slope. This is where you practice until you get it right, but most people get it right the first time! At the base of this rappel you are now at the stream level and to your left is top of a 50 foot waterfall. One guide rappels down and belays you from below as you take your turn going "over the edge." You land in a pool of water at the base of the falls, and swim across to the other side. A short scramble downstream leads you to the top of the second waterfall drop, with a height of 30 feet. 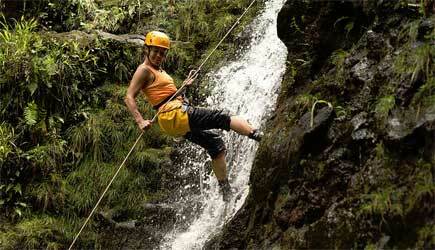 This tour is located in a rainforest where showers are frequent and Rappel Maui operates rain or shine. Weather cancellations are extremely rare. On high-water days when the stream is raging and it is not possible to rappel directly in the waterfalls they have alternate rigging points to rappel down 100 foot cliffs to the edge of the roaring stream. Experiencing the thundering waterfalls of the canyon on high water days is exhilarating, but swimming at the base of the falls is not possible on those days. Observers are permitted on this tour: You hike and swim, or, if you prefer not to swim, you can sit on a rock and observe. You watch the group as it rappels, then a guide will hike you down to the pools to join the rappellers. The valley is a gorgeous place to spend a day. Minimum age for this tour is 10. Waist must measure between 22″ and 48″, and weight must fall between 70 pounds and 250 pounds. Schedule: Tour operates daily at 6:45am, 8am, 10:30am, and 11:45am. This extended tour takes your rappelling to a new extreme! 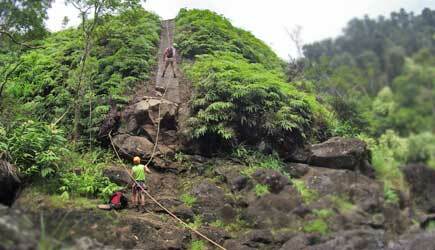 You will have the same comfortable transportation from central Maui to the rappel site along the Hana Highway. 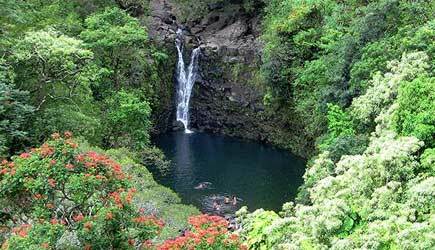 You'll start with a short hike to a 500 foot waterfall after you gear up. Your guides will give a briefing and demonstration, and you can practice on the 40-to-50 foot desecent. Feel free to try this rappel again! The adventure allows you to do as many as 4 advanced drops of up to 110 feet. 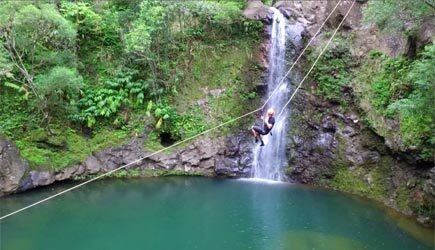 This includes waterfall rappels and a "zip rappel" or "guided rappel" through free space, past a waterfall, and finishes with an thrilling water landing. Depending on weather, you can climb the face of a 35 foot rock falls. You'll end with "Savage Ridge," a 110-foot dry rappel or you can repeat the zip rappel, depending on conditions. Head back on a well-maintain trail with a canopy of plants, ferns and trees. The hike is one mile, and you'll gain about 400 feet in elevation. As you ascend, you can use the anchored ropes as railings, and stop and rest, take photos and drink water when needed. Schedule: Tour operates on Wednesday, Thursday, and Friday at 8:30am. Minimum age 14. All participants must weight between 80 lbs and 230 lbs. with a waist size between 24" and 48". Not recommended for guests over the age of 65. Participants must be experienced in rugged activities and physically fit. They may refuse to honor bookings at the time of the tour, if participants are unfit in any way for the activity. Note: The tour itinerary may be modified if long periods of heavy rains or severe weather cause high or swift water or raging falls. In these cases, they use rappel stations that are a safe distance from the water course. NCL cruise ship passengers are able to do this tour on Sunday or Monday and the tour operator will pick you up at the dock. Passengers coming into Lahaina for the day may be able to do this tour, but a rental car would be required. This almost falls under the category of "extreme sport" but this isn't nearly as hard (or dangerous) as it appears. First of all, it is important to realize that waterfall rappeling is not “rock climbing.” This is not a physically demanding activity that requires a great deal of upper body strength. Gravity is your friend on this tour, and your harness and the rappelling device are there to allow you to control your rate of descent. While this activity isn’t PHYSICALLY demanding, it can be MENTALLY challenging as you stand at the top of a 60 foot cliff and “go over the edge.” It’s all about trusting the gear and trusting the guides who are there to talk you through the process and watch out for your safety. One guide is at the top overseeing your rigging and talking you through your descent, and another guide is down below, doing what is called a “belay.” By tightening the rope from below this guide can stop you from falling if you start going too fast. Most people who do this for the first time don’t have the problem of going too fast. 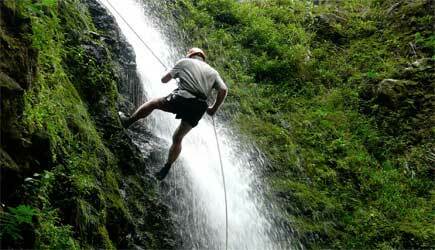 It is typically a slow and deliberate descent as you pass rope through the rappeling device. It is possible to skin your knee on a rock, but serious injuries doing this activity under guide supervision are extremely rare, and these guys have a great safety record. The first rappel is on a steep but not quite completely vertical hill. This practice gives you a chance to feel all your weight on the rope and to learn how the rappeling device works. This will boost your confidence for the first of two waterfall “drops.” You will get wet … you will have fun … and you’ll feel like you are on an expedition straight out of the pages of National Geographic Magazine! A short swim across the “pool” and a scramble down the streambed leads you to the second waterfall rappel. The setting where this tour happens is truly magical. This beautiful valley about a third of the way along the Road to Hana is known as Puohokamoa and is privately owned and not accessible to the public. It’s a fantastic place to spend a day and this is a truly remarkable vacation activity !I found the guides to be very personable and extremely knowledgeable, including lots of great island narration on the drive to and from the waterfall location. I HIGHLY recommended this tour! Zip Rappel is only on Wed, Thurs, & Fri. 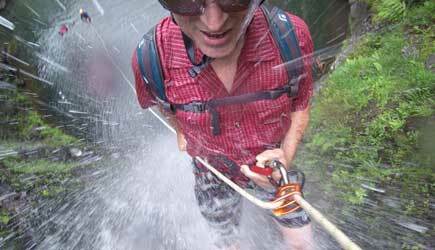 Observers are allowed ONLY on the Waterfall Rappel Tour.